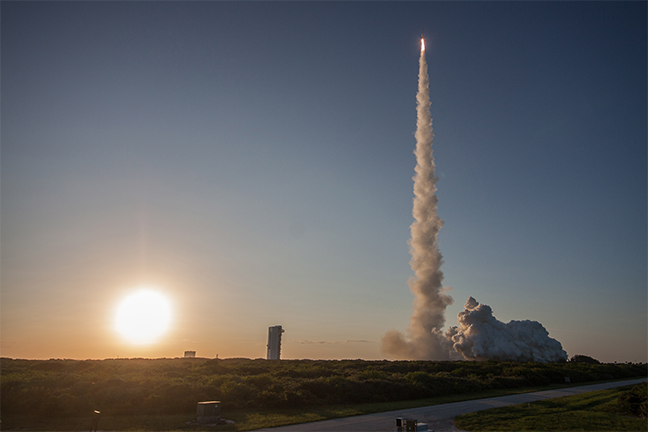 The OSIRIS-REx spacecraft, aboard a ULA Atlas V rocket, took off Sept. 8, 2016. A close-up image of Bennu’s rocky surface. OSIRIS-REx is a NASA and UA asteroid study and sample-return mission. Launched September 2016, the goal is for the spacecraft to collect a sample of dust and rock from Bennu, aiding research on the history of our solar system and life on Earth. It is expected to return with its sample in September 2023. Bennu’s surface is rougher than expected. Possibly the most important announced discovery is the roughness of Bennu’s surface. 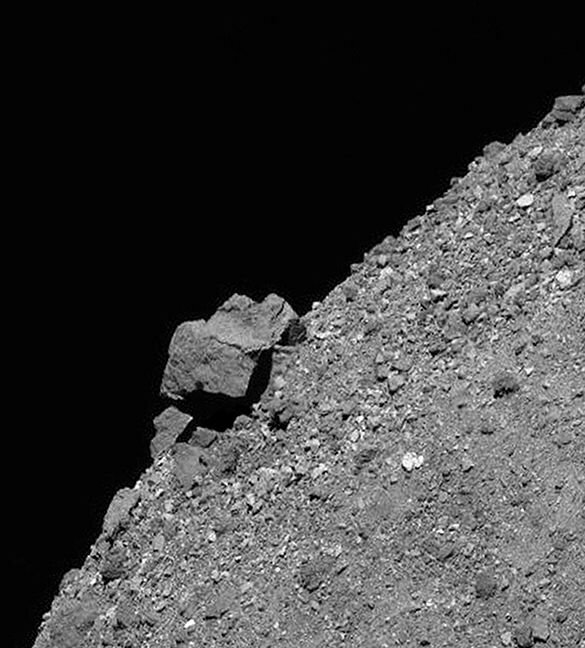 Scans reveal Bennu is “packed with more than 200 boulders larger than 33 feet (10 m) in diameter and many more that are 3 feet (1 m) or larger. The largest boulder measures 63 yards (58 m) across.” This is a far cry from the originally expected surface of gravel and pebbles. This discovery complicates the original plan for the spacecraft to collect its sample; instead of having roughly half a football field to navigate in, OSIRIS-REx will have to collect a sample in a site half the size of a basketball court or smaller. Bennu is one of the darkest objects in the solar system. High resolution images shot with OSIRIS-REx’s multiple cameras reveal Bennu to be one of the darkest objects in the solar system, reflecting only 4 percent of sunlight. This is due to Bennu being a carbonaceous asteroid, meaning its composition includes a large amount of naturally-dark carbon. However, researchers also found Bennu’s surface to possess a higher-than-expected variety of albedo, or solar reflection. Meaning the brightness of Bennu’s surface varies greatly from one area to the other, due to the rough surface. This presents an unexpected challenge for the spacecraft’s laser scanning system, or lidar. Bennu is a rubble pile. With a “spinning-top shape” already known before arrival, Bennu’s surface is older than expected, but shows evidence of recent activity. Scientists describe this as a “dynamic surface,” formed from multiple collisions with smaller asteroids. Bennu also contains a lot of empty space, up to 60 percent, but its shape indicates interior stiffness, with enough internal strength to allow the surface to crack. Bennu has water in its past. The first scientific data returned from the OSIRIS-REx mission, visible and infrared imaging reveal hydrated minerals on Bennu’s surface. For hydrated minerals to be formed, they must come in contact with water at some point in the past. Hydrated minerals are “ubiquitous across the surface of the asteroid,” and while Bennu is too small to have ever hosted liquid water, the finding indicates liquid water was present at some time on Bennu’s parent body, a much larger asteroid. Bennu is spinning faster. Bennu’s rotation is steadily accelerating at about one second per century. This increase is due to the YORP effect, where differences on the surface of a small astronomical body unequally scatter solar radiation. Due to Bennu’s aforementioned roughness and variety of albedo, it is catching and reflecting sunlight at different angles, causing its rotational rate to drift. Researching this phenomenon is one of the original goals of the OSIRIS-REx mission. These findings are found in several Nature Publishing Group journals. With the sample acquisition planned for July 2020, there is still ample time for more scientific observation and discovery at the asteroid.